I love this blend of flavours! 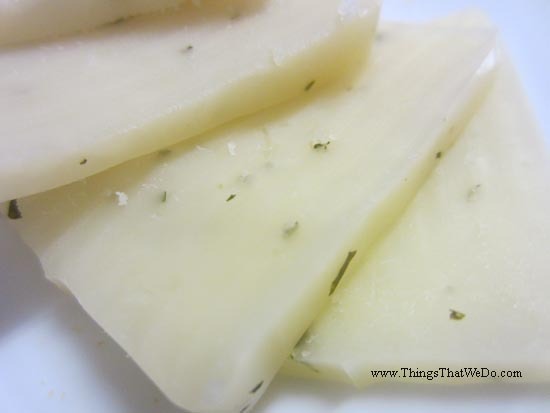 Gone are the days when your options for cheese consisted of plain, plain, or plain. 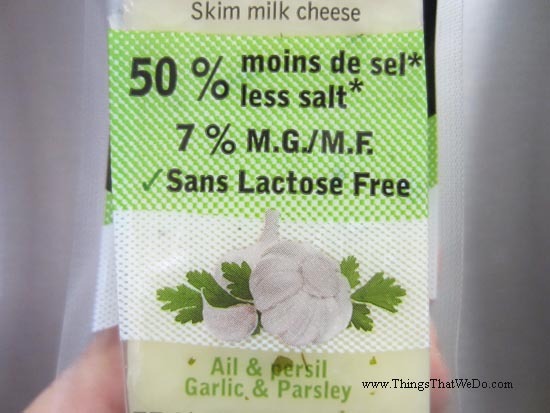 Cheese with reduced salt is given an extra peppy kick with the help of trusted flavours like garlic and parsley. 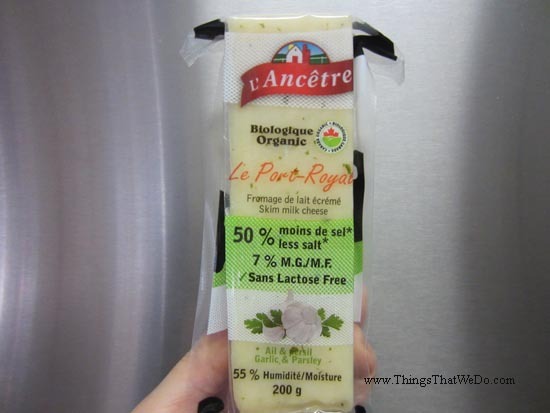 Product review: what ingredients are in the L’Ancetre Organic Le-Port Royal Cheese with garlic and parsley? Here are the ingredients that went into the L’Ancetre Organic Le-Port Royal Cheese with garlic and parsley: organic pasteurized partially skimmed milk, salt, calcium chloride, natural food flavour-enhancer preparation, bacterial culture, microbial enzyme, organic garlic, organic parsley. Hm..well, that’s good. 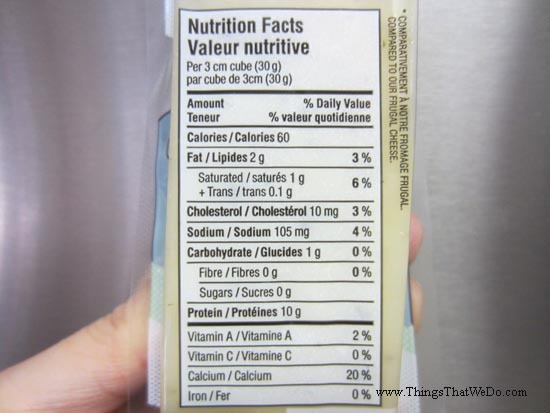 For 3 cm cube of cheese, you get 4% of your daily intake of sodium and only 3% of your daily intake of fat. 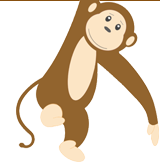 There’s 20% of your daily intake of calcium with 10 grams of protein. These numbers are a good option to some of the other cheeses out there especially if you need to be mindful of your sodium and fat intake. My one question mark: I have no idea what “natural food flavour-enhancer preparation” means. Why does that show up on the ingredient list? Likely, L’Ancetre has a special way to prepare their cheeses and trade secrets need to stay as trade secrets but this phrase leaves me with that ‘hm’ emoji floating in the air. 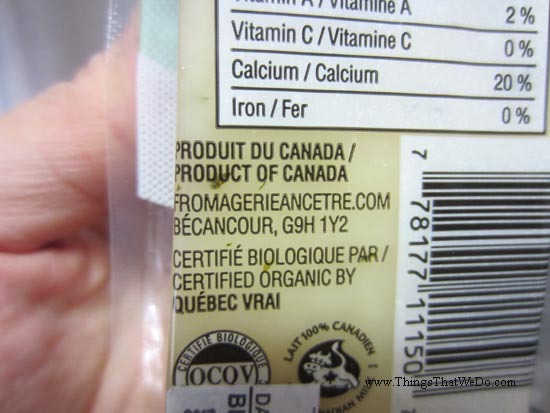 How does the L’Ancetre Organic Le-Port Royal Cheese with garlic and parsley taste? On first inspection, the L’Ancetre Organic Le-Port Royal Cheese with garlic and parsley seems like a drier firmer cheese, cutting like a Swiss cheese. Like a Swiss cheese, it also has a similar light mild flavour and slightly chewy bite. 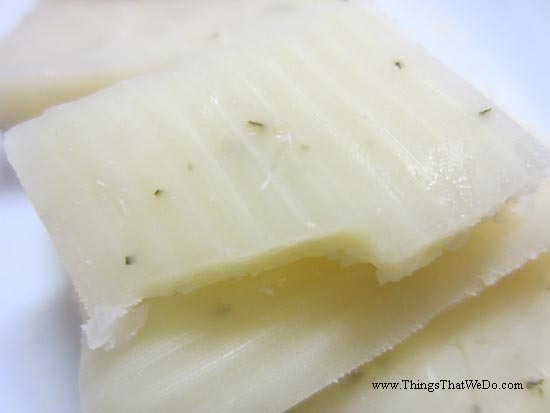 I like the lightness and how easy it was to eat the L’Ancetre Organic Le-Port Royal Cheese with garlic and parsley. The garlic adds a night light flavour as does the parsley. It elevates the cheese from everyday fare to a fun sandwich experience. Given its lighter milder flavour, you could easily pair it with other sandwich or appetizer toppings (maybe some hummus, avocado, and tomatoes?). I love that L’Ancetre has made lower sodium cheeses. Sure, I love cheese but I’m also quite aware that some cheeses (and many other foods) contain high levels of sodium that really doesn’t need to be consumed. Our bodies already work really hard to keep us all healthy and in tip top shape so if I can make it a little easier, why not? Better yet, this cheese is also lactose free making it a suitable choice for those of us who need it a little extra help. Low sodium certainly doesn’t have to mean boring!